40 Years of Goth Fashion - I love these fun videos that gothic goddess Liisa Ladouceur (author of Encyclopedia Gothica and more) and team made showing many aspects of goth fashion for both ghouls and boils. My fave is the men's video, shown above! Rain - I am loving all the beautiful rain that Southern California has been getting! It has been glorious to have so much nourishing, comforting rain pitter-patting on the roof lately. I love falling asleep to the sound (and smell) of rain. I hope more is in the forecast. is why he has a little shaved strip on his arm. 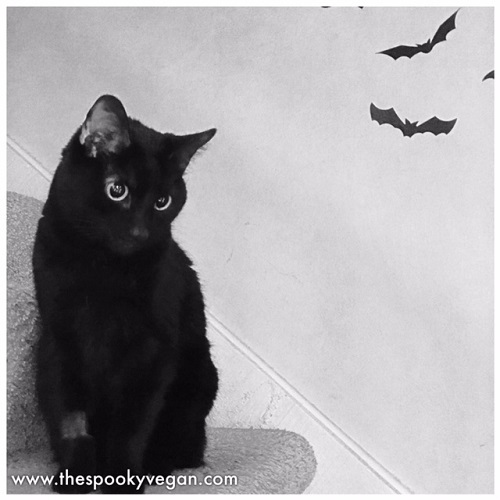 Havoc - If you follow me on Instagram, you know my baby bat cat Havoc was sick in late December and through January. He finally seems to get getting better - his blood tests finally came back normal, his energy levels are back up, he is eating normally, and seems much more comfortable. I love this little guy so much, he has been with me for 12 years and has always been a comfort to me and I am so thankful to have him in my life. 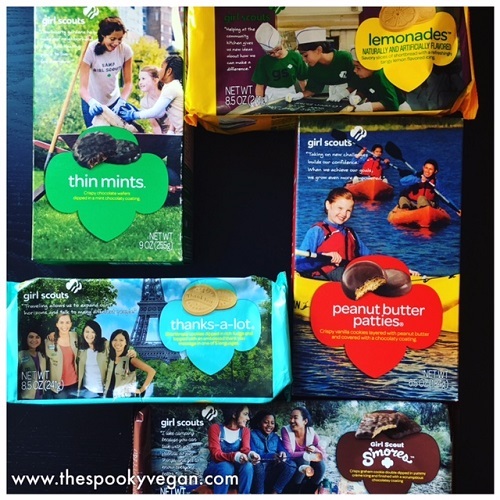 Vegan Girl Scout Cookies - Do you know that there are FIVE vegan Girl Scout cookies?! Plus, a new cookie was introduced this year that just happens to be vegan - the S'mores Girl Scout cookie! It is soooooo good, with dark chocolate enveloping a crisp graham cracker with hints of marshmallow flavor. Even though it is in no way a good-for-you food, I love it! I just wish I had a camp fire or fireplace to eat it by! "Take My Stuff" swap party! 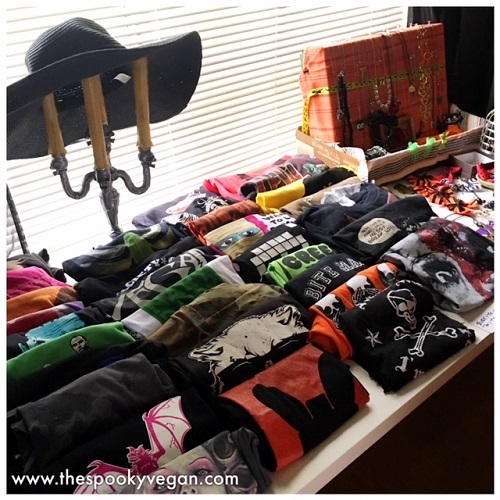 It was like having a gothic yard sale! Minimalism - About a month ago I saw a minimalism documentary and it inspired me to clean out my closet, which inspired me to clean out all the other parts of my house! I'll be honest, I'll never be a minimalist, but I am intrigued by the concept and really want to de-clutter my life, start to think more about what I buy, and try to reduce, reuse, and recycle things as much as possible. After I cleaned out my whole house I hosted a get together where people could come browse and take whatever they wanted. I got rid of sooooo much stuff! I had lots of clothes, knick-knacks, Halloween decor and party supplies (seriously like three big plastic tubs worth), kitchen and tableware, even food that I wasn't using, so it was such a relief to let all that stuff go to good homes! I'm glad I could clean house while also reducing the amount of waste and having others reuse items I no longer needed/used. 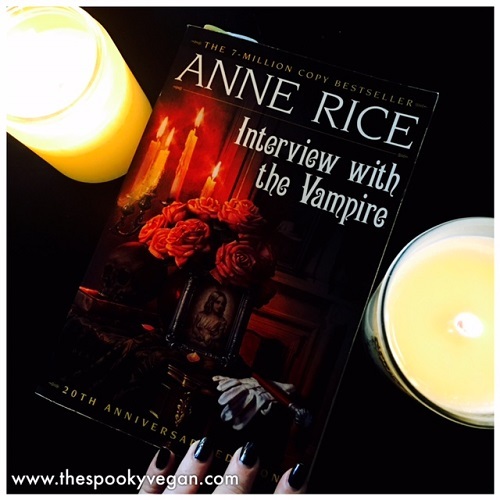 Re-reading Anne Rice's Interview with the Vampire - I devoured Anne Rice's books in junior high and high school, but I don't think I've read them since, so I picked up used copies of many of her books (sadly my old books have been lost to many moves) and started with Interview with the Vampire. This book is the equivalent cozy blanket and so comforting! I love curling up with it right before bedtime and reading a few chapters. Best ramen and perfect for rainy days! 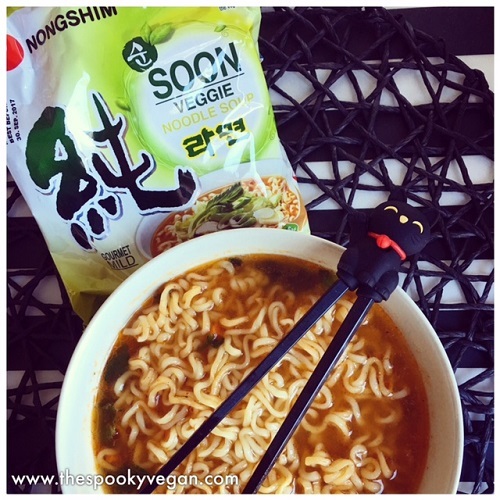 Nongshim Soon Veggie Noodle Soup - I finally found a vegan instant ramen that I love! I know that ramen instant noodles are probably sacrilege to foodies, but I love them and they are so perfect when you are sick (I'll take spicy ramen over vegan chick'n noodle soup any day!). These Korean instant noodles are HUGE, are the perfect level of spiciness and taste soooooo good. I order them from Amazon! The Golden Girls always has the best advice! The Golden Girls on Hulu - Totally not spooky OR vegan but I do love these ladies! I can't believe how witty this show is and how well it has stood the test of time. I normally never watch comedies or sitcoms, but sometimes you need a good laugh from some wise and crazy grandmas. Also, serious #squadgoals! 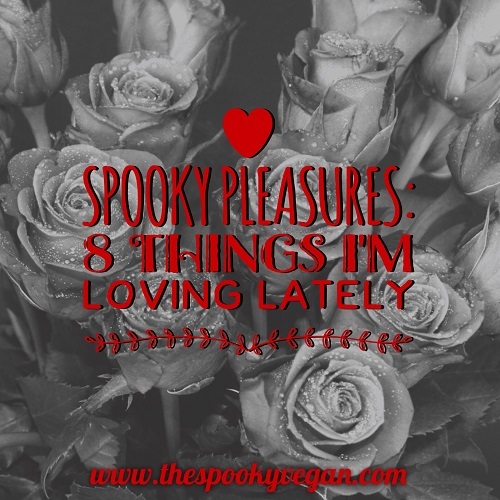 What are some things that you are loving lately? i tried the new vegan s'mores cookies from the girl scouts! i like them. however they remind me of the accidentally vegan graham squares from dollar tree! i love those things! I am so happy your kitty is doing better!